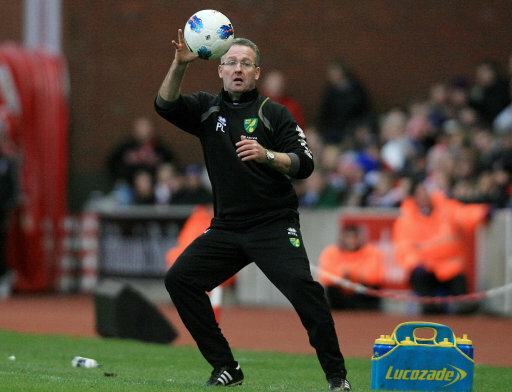 Paul Lambert Walks Out On Norwich After ‘Bust Up’, Runs Straight Into Aston Villa’s Arms? It’s all a bit erroneous as we speak, but there are reports being bandied around this morning that Paul Lambert has resigned as Norwich manager (though the papers are still framing the word ‘quits’ in inverted commas for the time being) in order to hold talks with Aston Villa about squeezing himself into their vacant managerial position. We’re hearing that Lambert’s representatives are due to meet the Villa higher-ups today after the Norwich board’s reluctance to left him have a natter with Randy Lerner and co. ended in a time-honoured ‘bust up’ – which is probably overly sensational poppyfeathers and horsecock, but one can never be certain. Anyway, as far as last season’s Premier League table is concerned, it would look for all the world like Lambert is all set to make a backward step, what with Norwich finishing up comfortably in 12th and Villa languishing down in 16th, a mere two points from the dotted line of doom – though that doesn’t tell the whole story. It’s fair to say that, while Norwich overachieved (or at least confounded expectations) last term, Villa massively underachieved as Big Eck sucked the vim and vigour from their veins. While the Canaries may have hit their ceiling, Villa are now in dire need a restoration job and, perhaps more saliently, have the money to throw at one. An attractive prospect. One things certain, Lambert and his staff have done an incredible job of hauling Norwich back up through the leagues over the past few years – his contribution will never be forgotten at Carrow Road, it’s just a shame it had to end in *alleged* acrimony. I think it’s a good fit- he’s clearly a talented manager but does need the funds. Villa are not a team who should be around the relegation zone. I’d guess just by playing a more expansive style he could get them to 12th or so in the first season. where’s the loyalty? Managers, players, everyone in and around football are filthy whore. Come to think of it it’s same everywhere.